Million dollar view from our Oceanfront Condo! Bathroom remodeled in June 2017! Fresh and New! We charge a discounted cleaning fee of only $125! We don't have any "hidden fees." Watch dolphins and whales swim by from the lanai... The sunsets are spectacular!! Relax or swim in the oceanfront pool... or barbecue and enjoy a mai tai! PLEASE WATCH OUR VIDEO!! You'll SEE and HEAR the waves which makes this location so special! This AIR CONDITIONED condo is close enough that you can walk to town. There's a Farmers Market right across the street where you can buy fresh fruit and have banana pancakes for breakfast! Small 12-unit complex... like your own private boutique complex .... Very quiet except for the ocean waves and lull you to sleep at night! Let me excite your imagination....When you open the front door and look toward the living room, all you see is ocean. You'll hear the waves crashing. It's incredible! Condo is fully equipped with everything you need, including beach gear. We have really upgraded the condo with new travertine floors and granite counter tops that are beautiful!! We have TV and cable in both living room and bedroom for your comfort. Hawaiian CD's await you. Fast WIFI internet for all you geeks! There is a very nice washer and dryer and is always available and no need to wait in line. FREE PARKING in front and security gate at the entrance. So, let us know if you have any other questions... it's always first come first served! 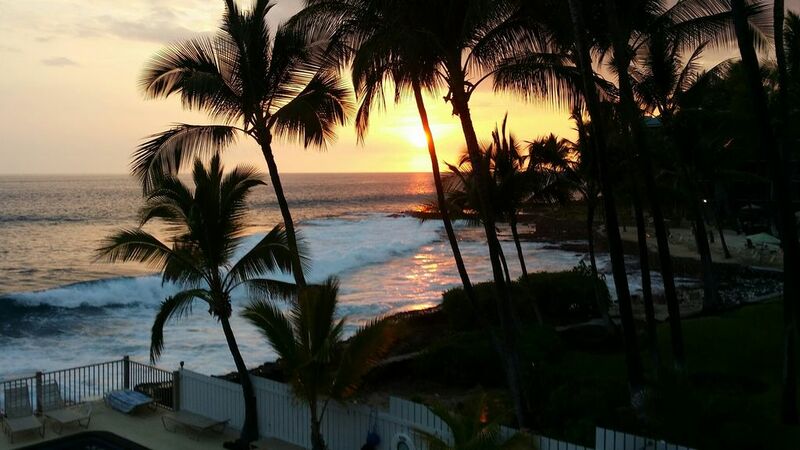 I fell in love with Kona 44 years ago and it is like a second home to me! So, I will be happy to give you my "secret" suggestions on what to do when you get there! You have the best of all worlds staying here! You are outside town where it is quiet yet, close enough to walk to town. Farmers Market conveniently across the street. This is a small boutique type complex... Our neighbors next door pay over $200 for the same view, only we are closer to the ocean! Washer and dryer downstairs available. Small complex so it's always available. You can watch movies in the bedroom with DVD player. Very quiet pool - typically you are there by yourself! Pool, Gas BBQ, Oceanfront pool, Farmers Market across the street. Free parking!! 7 Miles from the airport. Scuba diving, See a real volcano!! !